Only one person has taken me up on the offer to use my blog to continue a conversation started at the 2009 ACC Conference. Wendy Rosen requested that her response to Garth Clark’s lecture be posted here for your review and commentary. You are welcome to post your comments in response. Or you may contact Wendy Rosen directly at: www.Tiny.cc/FB_Wendy. Note: The opinions expressed by the author, Wendy Rosen, in this post are hers and hers alone, and do not necessarily reflect the opinions of ASKHarriete or Harriete Estel Berman. No endorsement or refutation is intended or implied. 10/30/09 An Opinion from Wendy Rosen. Garth Clark's 2008 lecture, "How Envy Killed the Crafts Movement," inspired him to deliver an encore presentation at the recent 2009 ACC Conference, “Creating a New Craft Culture,” in Minneapolis. Clark changed the name of his lecture, originally titled “The Case for Conservatism,” to “Palace and Cottage,” and then launched into a brutal and comedic post-mortem of the American Craft Council, which concluded with thunderous applause from the attendees, many of whom were current ACC trustees and fellows. While Clark’s presentation may have been the first “formal” slam targeted directly to the ACC’s trustees and fellows, what he addressed has actively been discussed in back rooms (and yes, even ACC exhibitor meetings) for at least the past 20 years. In no uncertain terms, he accused the “AARP ACC board” for its nearly 30-year history of misguided efforts and accumulated lack of relevance to the entire crafts community. Given the title change, Clark clearly recognizes and even embraces the (not so recent) democratization among disparate contemporary craft communities ranging from the DIY, ETSY and Steampunk crowds all the way to the museum acquisition/one-of-a-kind sector. His recognition of such nonjudgmental craft equality may come as a surprise to those who know him as a major New York gallery owner, dealer and critic. I’m sure he is not the only insulated New Yorker who had yet to recognize other arts organizations that decades ago began expanding to fill the ever-widening void created by the negligence of the ACC. Yet it’s wonderful to see what happens to someone when he finally steps outside of his New York art world bubble. Now permanently transplanted to new digs in Nuevo Mexico, Clark has declared his personal appreciation for all sectors of the movement, from amateurs to production artists and beyond, and now proclaims that the Council has indeed outlived its usefulness. Clark’s visceral critique of the ACC and its victims (at an ACC-sponsored event, no less) was received with both shock and awe by the audience as his arrows hit the most misguided ideals the Council has fought to defend and protect. Clark’s lecture made me realize my own neglect, that I should have reached out to him years ago with an invitation to the Buyers Market of American Craft in Philadelphia, where he could have discovered a democratic marketplace where $45 million in quality production craft is regularly sold in just a few days. Ironically, Clark’s vision of “the future” is actually a reality to the 1,000-plus production artists who have left the Council over the last three decades as the Council abandoned its best programs and services in lieu of dancing with the twin devils of elitism and arrogance. Garth Clark’s career has been rich and deep, at least in the rarified air of dealing in museum-quality craft, but now he’s trying to catch up with what he’s missed (or ignored), and to expand his understanding of the real and ongoing marketplace for professional production and functional makers. He can obviously name the entire list of 1970s Rhinebeck artists who took the glittering path from production to prosperity, but there is a huge gap in his knowledge about the diverse paths and opportunities available to so many successful artists in the production marketplace. Many of the “needs” Clark outlined in his lecture are fulfilled in the “middle marketplace.” Yes, Garth, there is (and has always been) a world outside of the ACC and it’s New York duchy. Dozens, perhaps hundreds of other arts organizations provide business education, mentoring, guild co-operative support, wholesale markets, magazines and online wholesale websites. And yes, AmericanStyle magazine even has well-established tourism economic development programs and websites for cultural travelers. Clark may be a newcomer to the crowds at any one of a thousand small town First Friday events. He needs only to read the annual Top 25 Arts Destinations issue of AmericanStyle magazine or “Google” the words “arts walk”, “gallery crawl” or “studio tour” to find our new craft culture. While the integrity of the jurying process and the best practices of the ACC may well become part of our past, we in the production/limited-edition sector of the arts marketplace are at peace with all of that. If, years ago, the Council had provided an umbrella support system, the development of a new progressive marketplace would have been a much less painful process for the thousands of artists and organizations we’ve lost due to recessions and the lack of business education and resources. The Council could still create an “information hub” for every arts organization, and thus receive as much financial support from groups as it receives from individuals. The successful community of for-profits including SOFA, The Rosen Group’s Buyers Markets of American Craft, ACRE, ETSY, NICHE, AmericanStyle magazine, Artful Home and dozens of regional guilds, could become loyal, generous and grateful supporters. Over the past 30 years, the ACC has been struggling to find its way. It finally hit on the “right” thing to do when it hired Andrew Glasgow, a member of our own tribe, as executive director. It was a short, glorious time for the artists, academics, leaders of other artist organizations, writers and the media. His recent illness is only one of ACC’s great losses. Today the organization is faced with finding new headquarters, new staffers, new leadership and a new vision, as well as coping with the problems of a smaller and rapidly aging membership base. A Board of Trustees filled with affluent collectors and upper-crust professionals will never understand the needs of working artists in the trenches. The by-laws set forth by Mrs. Webb clearly provided for a balance between the “classes” on the board. It’s sad to see so few Trustees attending more than one day of any ACC show. Had they stayed for a few days, they might have learned what their member artists really needed. I know I’m not the only member that has offered solutions and assistance (more times than I could recall). But, it seems the ACC board may be too proud (or arrogant) to accept help. The everything in “them and us” culture prevents them from embracing new ideas or partners. If they had only seen the bigger picture.... Now it may be too late. Comments to this post may be placed in the comments section below and/or sent to Wendy Rosen's Facebook page. If you want to compose a more extended reply as a complete post, just let me know. The organization of the ACC Conference 2009 was like going to a concert. Each lecture progressed to the next like a rising crescendo. The sequence resonated from beginning to end. Each day began with a book author opening the conversation for the day with broad conceptual strokes of information. While I wasn't particular keen on Richard Sennett's examples, he did lay a foundation for the conference in expressing a value in quality, the handmade, and problem solving for success. This was reiterated on many occasions from different directions by the subsequent speakers. Elissa Auther provided a basis for craft culture with a brief insight into historical influences. Sandra Alfoldy's panel tried their best to pull out a 21st century craft Identity. Adam Lerner gave us a Mixed Taste combination that was unforgettable. Natalie Chanin showed a personal story of success for her and her cottage industry. I just hope they make enough money for health insurance and dental care. Faythe Levine should glow with enthusiasm given the visibility afforded her Handmade Nation book and video about the D.I.Y. community. Rob Walker opened our eyes to the competitive nature of discretionary purchases in the art and craft market. Riding the LONG TAIL may give us whiplash but we should jump on the opportunity instead of pondering about the lack of hierarchy and external validation. Robin Petravic showed how great design combined with technical skill and craftsmanship can lead to successful products. Garth Clark was like a double latte with foam on top, very stimulating but some bubbles popped. Sonya Clark's panel overcame a yes/no "standardized" test format to impart broader insights. Thanks go to the Conference organizers for putting this all together so well. Next time invite everyone to the party. It will be so much better. "Lifestyle and Livelihood" the premise of the Conference resurfaced frequently. The debate was illuminating and wonderful, but there remains no solution in sight. A weak economy and a craft marketplace in flux makes this harder than ever for the artist or maker trying to make a living from their work. For the speakers that do make their living from their work, such as Natalie Chanin (Alabama Chanin) and Robin Petravic (Heath Ceramics), working from a sincere, authentic place is fundamental for success. There was a genuine effort to engage the idea of multiple craft communities. This is easy to understand with the sewing community for Project Alabama or the multiple museum curators on stage. On the other hand, the D.I.Y. (Do It Yourself) and indie community (capably represented by Faith Levine and Garth Johnson) didn't seem to be in the audience. Why not? The same goes with more working artists and makers. It was kind of embarrassing to be one of the few people listed as attending the Conference without a title after my name. Maybe I should have made up my own title since I made up my own role! How about "Exhausted, Overwhelmed Blogger". If you have any further opinions, or insights, please add them to the comments.I look forward to hearing from you. Thanks to SNAG and Etsy for sponsoring the carry bags at the Conference. Use you bags, reduce waste! Read the summary of the ACC Conference from Emiko Oye. Amy Shaw has an very nice selection of photos from the American Craft Council Conference on her Flickr page including photos of the speakers, audience and sculpture in Minneapolis. Found Curve, Journal of Modern Craft. When I find more I will add them to this list. BACKGROUND: I have been familiar with Sonya Clark's work since being in a show with her at the Museum of Contemporary Craft in Portland, Oregon titled, Manufractured: The Conspicuous Transformation of Everyday Objects. We each also have a chapter about our work in the book of the same title. This is a fascinating book especially if you are interested in alternative materials. I also saw Clark's work at the Museum of Art and Design in New York City in the exhibition Second Lives. Her work is intelligent and content driven. CLICK HERE to view her web site. The image below and to the right is my personal favorite, a portrait of Madame Walker fabricated with black plastic hair combs. This makes a lot of sense when you know that Madame Walker was the first successful black woman millionaire entrepreneur that made her own fortune by selling hair products for black hair. Actually, Sonya Clark collected 150 questions from a wide range of individuals (before the conference) and culled the questions into a 35 line Questionnaire handed out to the Conference attendees on Friday. (Download SonyaClarkQuestionaire.) Emiko Oye 's blog reviewed the questions considered most relevant and least relevant. Actually the questions (on the Questionnaire) were difficult to decipher, sometimes even cryptic. I wasn't the only one who wondered what some of the questions meant, let alone the difficulty of giving a "yes" or "no" answer to many complex questions. It is rather ironic that we are looking at a questionnaire requiring "yes or no" answers. At the beginning of the conference, Richard Sennett inquired why we base so much learning and education on standardized tests,...as in "yes or no" answers. The Conference had come full circle...but certainly not in the way anyone expected. The panelists' responses were far more interesting, especially Lacy Jane Roberts and Garth Johnson. "Every time you make something you should be critically thinking. When critically thinking you should be critically making. Like a pinball machine bounce, bounce, bounce." "What will happen to artist estates when they die?" "celebrate diversity and still celebrate pioneers.."
WHAT DID I LEARN? That Lacy Jane Roberts and Garth Johnson are really interesting people. That is the best part about going to conferences, the unexpected exposure to someone or something that you didn't know before. LIFESTYLE OR LIVELIHOOD? It looks like all our panelists have a mixture of lifestyle and livelihood, but it doesn't look like any one makes their living exclusively from making art or craft. Is that is too much to expect? I don't think that any art or craft person deserves to make a living from their skill or production, but it is really shocking AND disappointing that even noted art and craft professionals (for lack of a better word) can not survive, or even thrive, selling their work. They don't have the opportunity to more fully dedicate themselves to their avocation and profession. SUMMARY: It was a wonderful idea for Sonya Clark to share the dais with additional speakers. I liked hearing what these people had to say. However, it seems like a fleeting moment and the questionnaire (developed before the Conference) did not function as a conclusion to the Conference. Perhaps Clark could have asked the speakers what they thought were the strongest moments or content issues during the conference and gone from there into a conversation. I believe this alternative format would have been equally effective and a lot less laborious. This is the last lecture of the Conference but NOT the last post. Stay tuned to the next post, an entertaining INDEX to every lecture in the Conference. The final post will be the super opinionated "download from my brain" designed to summarize some of the issues rasied during the Conference. ADDITIONAL RESOURCES: The description for Sonya Clark's panel discussion published online and in the Conference brochure was very poetic. I really liked it, but ultimately the program was not even remotely connected. I have included this paragraph for your review below. It is worth reading. "Craft is the subject of our conference. As its creators, collectors, critics, students, and historians, craft is also the object of our affection and attention. But, as we all know, craft is also an action. But craft is not only a series of finely honed skills; the field itself is a work in progress with deep roots and ever expanding branches. Craft is evolving, transforming and growing. Craft is a verb. A deep understanding of craft’s evolution necessarily involves everyone’s input. Throughout the conference a team of artists and volunteers will gather participants’ insights on craft as a subject, verb and object. In this closing session Sonya Clark will compile and present this information. Together, our collective wisdom will shed light on the directions and definitions of craft." Read Emiko Oye's blog for another perspective. BACKGROUND: Whenever I see Garth Clark, I can't help but think of his controversial and thought-provoking presentation that he gave for the Museum of Contemporary Craft in Portland, Oregon titled, “How Envy Killed the Crafts.” You can find a link to his podcast HERE. (The lecture is now available as a print on demand publication.CLICK HERE) I highly recommend that you listen to this earlier lecture which has instigated a huge international debate on the future of craft. Garth Clark's lecture at the ACC Conference was billed as “The Case for Conservatism” but he immediately stated that he was changing the title of his lecture to "Palace and Cottage". After a slow start with a preface about his lecture at the Museum of Contemporary Craft, he charged right into his content with an amazing voice. Though he was obviously reading his notes, he spoke slowly and carefully enough that the audience could follow his train of thought. I don't agree with everything he had to say but it was great to listen to this level of conviction and credibility. I do wish that he had offered us a handout or showed an outline on the screen. This would be extremely helpful when you want to follow a train of thought closely. I understand that ACC will be offering a podcast of the lectures from the Conference. Definitely listen to his lecture! Craft is a vast political, anti-industry, aesthetic movement and it's time for it to be a new era of social movement. This idea resonated with the previous lectures during the Conference. He continued...Craft from the 20th century was a rank and file, trickle down structure. From 1980 to 1995 it was the Palace of Versailles with high prices, obsessive craftsmanship, excess and pretension. Ironically, Garth Clark is one of the individuals that profited the most from the strong prices and escalating market as a Gallery owner (with a big "G") in New York City. Craft of the 21st century is non-partisan and building from the bottom up as a result of the Internet. Clark suggested that we should go back to the cottage industry roots of craft culture supported by Aileen Osborn Webb - hence the term "cottage" in the revised title. In both of the previous examples, he speculates that Art/Craft is a barometer or expressive indicator of society's values. No argument there, but it is interesting that a man of his introspection and intelligence sees this as a revelation. At this point, Clark is enamored by movements and communities such as Burning Man where people of all strata and professions (including from outside the arts community) make art for no monetary exchange. (It is again ironic that Garth Clark thinks that Burning Man is a new movement since it has been around for at least 20 years. Guess he was too busy making money to look at art that was free.) Sorry Garth, just couldn't help myself...guess this blogging thing is breaking down my inhibitions. Garth continued with statistics that show that many artists have a household income after expenses of about $24,000 a year. Clark asserted that the government should support the arts with new programs at the Federal level since the states have no money. He continued about how unfortunate it is that a $16 billion profession (referring to the crafts world at large) has never had a lobbying arm or professional structure for job training or apprenticeships. This becomes a more urgent issue as so many colleges are reconsidering whether their craft programs belong in an academic institution. Garth did suggest that if academic programs could reorient their direction and title to "Material Studies" that this would be a more effective umbrella for craft media and technology. Sounds like a great idea. WHAT QUESTIONS WERE ASKED AND ANSWERED? For the first time in the whole conference the questions were right on target and actually inspired further dialog from Garth. The audience was HOT! It was magic. Unfortunately, the questions were rather vague and I couldn't figure out what they were asking before the person sat down and Garth started talking. But take my word for it, this was a dialog that could have gone on for hours. He was asked why he criticizes the craft movement for its weak direction and materialistic attitude when he was making tons of money as an 'art dealer.' That is a good question! It really is too bad he couldn't be a better advocate for change and make money at the same time...lots of people do "speak with their actions, and walk the talk." WHAT DID I LEARN? Maybe Garth Clark should go to Washington D.C. He knows how to talk with a "silver tongue". LIFESTYLE OR LIVELIHOOD? Garth Clark obviously made a great livelihood from the arts and crafts. It sounds like he now has an amazing lifestyle with his partner in Santa Fe with lots of dinnerware sets....(my personal passion). Hope he invites me over for dinner. SUMMARY: Garth Clark is a great speaker. It would be marvelous to talk with him over dinner with a group of articulate individuals to advocate for change within the crafts. I do take a small offense that he thinks that anyone who makes art or craft for money, especially at higher price points, lack integrity or sincerity. I think that an artist or maker can sell their work without "selling out." I do not agree with Clark's assertion that it is the government's responsibility to support the arts with new programs with government funding. I do agree that the arts organizations of all media, all strata, all agendas need to join together in one political movement like the Milk Advisory Board, California Raisin, the beef industry, Almond growers, or Wisconsin Cheese, just to name a few. Without a lobbying arm and political advocacy we will never have even the modest laws that can help artists and the arts community. ADDITIONAL RESOURCES: Read the blog post on www.blogrewarestyle.com about Garth Clark's lecture at the ACC Conference for another perspective. READ any one of Garth Clark's multiple books. I posted a couple of his books on the right side of this blog (scroll down). Just CLICK on a book image. Please feel welcome to add your observations, content, or questions in the comments area.The conversation started at the Conference will only continue if you decide to participate. Wendy Rosen has composed a personal Opinion piece about the Garth Clark lecture. CLICK HERE. ACC Conference: Lydia Matthews -"New Models in the Marketplace"
The description of Lydia Matthews lecture in the ACC Conference catalog sounds like a collection of "fun to hear phrases" that leaves the listener impressed that something important will be said, but you sure can't figure out what it will be. This ended up being a prophecy. The description from the catalog is at the bottom of this post just in case you want to try to read it yourself. CLICK HERE for the podcast of her lecture from the ACC Conference web site. Lydia Matthews gave us tons of information, her voice was easy to understand, her diction excellent, her demeanor pleasant, yet after looking at my pages and pages of notes, I can't figure out what she wanted to say. This lecture was like the Emperor's new clothes. Obviously, she is very intelligent, but when a lecturer stands up and reads the lecture, directly from the paper, at break neck speed, this is not communicating with the audience. Lydia Matthews lost me right after she showed a half full glass of water at the beginning of the lecture. I've looked at my notes over and over, but lacking a coherent structure to the lecture, it is as if I wasn't even there. Sorry Lydia. If you are reading this blog post, I hope this is constructive criticism. When giving a lecture, all public speaking experts tend to agree: an opening paragraph with a maximum of 3 to 5 key points, a presentation that expands on those points, and a recap summary conclusion helps the audience remember what you want them to recall as the primary message. WHAT DID I LEARN? The importance of communicating with the audience and a strong conclusion in a lecture. LIFESTYLE OR LIVELIHOOD? Lydia Matthews makes her living in the academic world. SUMMARY:You had a choice between defining the image (above) as a half empty or half full glass of water. I am an optimist. The next time Lydia Matthews gives a lecture she will speak slowly. Lydia Matthews will consider how, in the face of dire forms of economic and social crisis, new models of studio practice, creative research and entrepreneurship are emerging from the ground up around the world. Acutely aware of our dynamic and complex contemporary lifestyles, which are simultaneously local and global, many artists have recognized the intrinsic value of craft as a personally fulfilling activity and as a visual expression of exploring, interrogating, and revolutionizing material. Craft practices are proliferating in multiple arenas today, tapping into new media networks, microeconomic systems and diverse cultural contexts that extend beyond traditional gallery models. New forms of thinking within that are proliferating in the design world may help us account for how craft can be understood as a way to survive and thrive in a rapidly changing environment, and a way to design not only objects but also proposals for more sustainable systems and modes of living. The last lecture on Saturday morning was by Robin Petravic titled, “Good Design + Good Craft = Good Sense: The Story of Heath Ceramics”. The previous lecture about the industrial design profession was the perfect preface as Robin Petravic and Catherine Bailey (pictured at left) were both design professionals who decided that they didn't have enough connection to the making of the final product. In 2003 they purchased Heath Ceramics continuing a long history as one of the last artist-owned potteries producing tableware in California (perhaps in the United States). Heath has a rich history which you can read about on their excellent website. I highly recommend that you look carefully at how they present their story to the public to create an identity for Heath Ceramics and their product. What might be most relevant to everyone reading this blog or listening to the lecture at the ACC Conference is that these are two people who have chosen to make the craft of ceramics both a lifestyle and a livelihood not just for themselves but for a whole community of individuals. Their success depends on intelligent design and producing a quality product by employees that take pride in craftsmanship. Robin Petravic and Catherine Bailey have grown Heath Ceramic to 5 or 6 times what it was a few years ago. WHAT DID I LEARN? Heath Ceramics exemplifies a superior business model demonstrating that good design, quality craftsmanship, dedicated employees and intelligent marketing are viable in our consumer society. LIFESTYLE OR LIVELIHOOD? Lifestyle and livelihood for all participants. SUMMARY: Study the web site. Look at how Heath Ceramics markets their products. Read every paragraph on every page and commit it to memory. This is what we need to communicate about what we make and why we make it. They raise issues discussed by other speakers in the conference such as buying local, environmental impact, hand craftsmanship, plus one more never mentioned, a living wage with full health care benefits, retirement benefits and workers compensation coverage. Julie Lasky did a great job with the technical aspects of her presentation using film clips and wonderful images of the design industry to illustrate her program, Men in White. She showed numerous symbols and metaphors that were quite interesting or attractive such as iconic photos of Industrial Design professionals and movie clips from the 1950's and 60's. She noted the absence of women during this period of time. Unfortunately, the point of her presentation was not entirely clear to me - and I know quite a bit about industrial design. Was she talking about Industrial Design as a male dominated industry? A review of the lab coats as symbol? I couldn't figure out where this presentation was headed. To point out that Industrial Design has been a male-dominated arena is obvious. During most of this time period, women were generally not included in any professional environment. The layering of symbolism about White, as in "Men in White" lab coats seemed unimportant to their significant contributions in industrial design. Regrettably, this wasn't the right lecture for this audience. Most of the audience probably didn't have an advanced level of knowledge about Industrial Design in the 20th Century. And the presentation didn't provide enough background or tight structure to bring them up to speed. I felt like we were on a ride in a sleek vehicle with lots of gear shifting but with no clear destination. WHAT QUESTIONS WERE ASKED AND ANSWERED? Skip this, the issues raised are not significant. WHAT DID I LEARN? Lasky did reawaken my interest in some excellent classic movies. We should all watch the film, "North by Northwest" with Carry Grant and Eva Maria Saint, and "Executive Suite" with William Holden. In both films take note about how the characters, and Industrial Design takes on a metaphorical role. LIFESTYLE OR LIVELIHOOD? In the case of Industrial Designers, they typically aligned and actively promoted lifestyle and livelihood as a public image. In fact many of them were amazing effective at self promotion and creating an identity as "Design Gods." They were regularly featured in the major consumer magazines such as LIFE, TIME, and Good Housekeeping. SUMMARY: Julie Lasky obviously knew her topic very well, but it needed more foundation and substance for an audience that was unfamiliar with the topic. There is much to gain by learning more about the way Industrial Designers shaped our world, invented the concept of "planned obsolescence" and created a whole new industry starting in the 1920's and 30's that lead to fame and financial success. They understood the art of self promotion and educating the general public about the importance of their role. Look at this web site for Raymond Loewy "the Father of Industrial Design"
Information about Charles and Ray Eames include their web site, Eames Foundation and Eames Library of Congress exhibition. Learn about the origin of transportation graphics that we take for granted every day (many designed by Vignelli Associates). Amazon has tons of great books about Industrial Design . It is worth the time to read at least one or two. These men really new how to create a "persona", engaging both the executive level and the general public in the value of their work. Crafts people have a lot to learn about both lifestyle and livelihood from design history. Do you know what the "long tail" is? The "long tail" is a catchphrase about how the Internet enables consumers to easily find and connect with relatively obscure and widely dispersed suppliers. It allows anyone, anywhere, with unusual interests or taste to find items from the smallest niche suppliers, makers or manufacturers. This is in stark contrast to the limitations of a "brick and mortar" store that must restrict its inventory to only relatively popular items and the physical limits of its shelf space. Both Amazon and Netflix are good examples of the near limitless inventory available through the Internet. They can offer an enormous number of products from the most popular down to extremely unusual items. Similarly, art and craft fit perfectly into the "long tail" phenomenon and can leverage the Internet as a highly effective marketing strategy. This round table discussion, moderated by Namita Wiggers, brought out the range of perspectives regarding marketing on the Internet from professionals in the field. BACKGROUND: Namita Wiggers was curator at the Museum of Contemporary Craft, Portland, Oregon. Lisa Baye is CEO of the "Artful Home. The Artful Home website offers a wide spectrum of objects, clothing, jewelry, designer objects all selected by the Artful Home staff. The Artful Home is one of the rare website marketplaces that uses the same commission structure as "brick and mortar" galleries. Artists who want to be included in one of the seven mail order catalogs distributed during the year must also be showing work on the website. Revenue is generated by the commission structure, listing fees, and paid advertising. Etsy is represented by CEO Maria Thomas whose background was primarily in online marketing. In recent years, Etsy has exploded in popularity with participants from D.I.Y. to more seasoned professionals. Etsy presents no barriers to participation. There is NO registration fee nor participation fee for sellers. Sellers agree to pay 20¢ per item for a four-month listing, plus 3.5% commission on each purchase. There is also a social networking aspect which some makers consider important, but participation at this level is optional. Additional revenue is generated through paid "showcases" and a limited amount of print advertising. Until very recently Etsy was only about the Internet. Amy Shaw was the third panelist. She is a writer, blogger and independent curator in Brooklyn, New York. "Amy and her husband started Greenjeans as the place where they could put their values and ideas about craftsmanship, sustainability, and conscientious living into action." This site and the "brick and mortar" location were a "business concept rather than a business plan" so they are no longer in operation. The blog is closed. Namita Wiggers asked questions of the panelists, but most of the panel discussion was focused on the difference between Artful Home and Etsy. Artful Home represents a combination of old and new business models but it's fees and marketing are definitely based more traditionally requiring payment upfront for review and participation, selection of work by a jury review, 50/50 commission structure, and a printed catalog. Etsy allows everyone to participate for free, there is no review, and the low commission is offset by millions of items listed 20¢ at a time. Contrast the business models by reviewing the chart below to understand the major differences. listing fee $300/yr. 20¢ per listing 4 mo. Artful Home clearly established that it is a "quality filter" for the consumer which it says is a benefit to both the consumer and the seller. There was no discussion about how they justified such high commission fees (a fee structure that is highly unusual among Internet sites). Etsy CEO Maria Thomas suggested that the Treasury and Favorites categories on Etsy play a role as "filters" but I think that is an overstatement or a very low hurdle. Both the Treasury and Favorites have social networking aspects on Etsy along with "heart-ing" your friends. The contribution to Etsy from the various revenue streams was not clearly discussed either. I've heard that commission revenue is not significant and is far outweighed by the millions of listings at 20¢ each - that is a lot of money. Amy Shaw was relatively unknown to this audience and her credibility was never clearly established. We did not hear why she was considered so influential. Her comments were knowledgeable but did not add much content to the conversation. SUMMARY: There were several key issues raised which all merit further discussion. These include the roles of "filters" either with online search technology, peer review, jury or curatorial selection, or the role of galleries. Additional issues involved the idea of multiple craft communities, participation without judgment, the importance of social networking, blogs, twitter, and Facebook to generate visibility. I wish that there was more time to discuss these topics in depth. After these blog posts about the Conference are complete, I will discuss these important business issues in future posts. The Q & A session was postponed. They just ran out of time. WHAT DID I LEARN? I learned more about Artful Home because I researched it before the Conference and sat with Lisa Baynes, CEO of Artful Home at lunch. I would like to see some evidence that Etsy could effectively serve segments other than the low priced end of the craft market. LIFESTYLE OR LIVELIHOOD? It still seems that most artists can not make a living from selling their work either online or in the established craft world. Our lifestyle is romanticized, making a livelihood is more like an aspirational goal. Long Tail, The, Revised and Updated Edition: Why the Future of Business is Selling Less of More . It is absolutely essential reading if you want to understand the potential for Internet marketing. Imagine my astonishment, WOW!, to see an image of this pin up on the big screen as people walked into the lecture room on Saturday morning. Actually I made this pin a year ago as a present for Rob Walker after he did a Q & A with me on his blog Murketing.com. Rob Walker is the author of Buying In: The Secret Dialogue Between What We Buy and Who We Are (2008), and a contributing writer and columnist for The New York Times Magazine. His column, Consumed, has observed and assessed consumer culture, design, and marketing since January 2004. Walker also writes for his own blog site, murketing.com. He lives in Savannah, Georgia, with his wife, photographer Ellen Susan, and their dog, El Rey de los Perros (the king of the dogs). Rob showed his dog several times during the lecture as a diversionary "feel good moment" whenever he said something controversial. Since I could care less about dogs, this fell flat for me. Overall, I loved Rob Walker's lecture which he wrote specifically for this conference. Walker started off with the statement that he does not think that there is A craft culture! but that "there are craft cultures, plural." His intent was to declare that the craft movement consists of a variety of currents, so the general movement is up for grabs in a way that was not true 5 years ago. With this statement in mind, he thought it was an "interesting time to examine craft culture in the marketplace." Tensions arise within the craft community due to the latest emerging currents such as new wave, indie, and D.I.Y. in contrast to the more established craft world. But in the marketplace, these tensions are far less important than the impact of consumer preferences. Consumer culture is filled with contradictions following three themes. Walker applied his appraisal of the marketplace to the crafts/D.I.Y. as one combined issue, and maybe he is right. He observed that buyers of craft work are driven by typical market forces; that buyers buy because of perceived benefits in relation to all other possible purchase alternatives. But the trade-offs shift over time. For example, consumers enjoy owning more things but the negative environmental impact has now entered their assessment. "No Credit Card Required" "Try it Today" "No Commitment"
The issues and structure that Rob Walker presented seem much too complex to digest in one short review. It's more like the basis for an entire book. Add the fact that this lecture was not about craft itself, but the external market forces and their impact on the "idea" of a handmade object in a world of mass produced consumer goods. For example, many consumers crave the authenticity of a handmade object because it is something that they can understand and appreciate, in contrast to their dependence on mass-produced products that they can not understand, make or even repair. The marketplace (including the craft marketplace) is filled with opposing desires within the consumer. Two examples are that "consumers are attracted to novelty while expecting the familiar" and consumers "demand the very best when they demand the cheapest." WHAT QUESTIONS WERE ASKED AND ANSWERED? Once again the questions were not questions, but rambling thoughts...we should have skipped this and asked Rob Walker to sit with us at lunch for discussion. WHAT DID I LEARN? Walker did evaluate some of the current trends in craft marketing. He prompts some thought provoking insights about the influences in the marketplace, how to understand the consumer and learning "why we buy, what we buy." The hand crafted has a story about the unique and irreplaceable. However, when it comes to successful selling, the story is not about the maker, but how the buyer sees and identifies with what they buy. LIFESTYLE OR LIVELIHOOD? Ultimately, the only thing we have to sell is our commitment to the handmade as a lifestyle and as a livelihood. This is what makes us unique to the consumer. Selling this identity to the consumer and having the consumer identify with this idea is key to financial survival. SUMMARY: Rob Walker's lecture was a foundational introduction to the second day's lectures on the marketplace for craft and the future of craft. However, the title of the lecture was a little misleading as it was not about just the Internet. We need to think much bigger, uniting and joining every media and every craft organization, from D.I.Y. to SOFA. If we continue to rip our collective consciousness about such trivialities as the value of traditional methods versus new fabrication methods (as one example), there will never be enough social and political momentum to support the arts. We would all be better served by an umbrella of combined marketing and political action group like the Milk Advisory Board, California Raisins, or Sunkist. ADDITIONAL RESOURCES: If you are interested in understanding our consumer society, I recommend reading these books. Do you have a book suggestion? Please add it to the comments. Read Emiko Oye's blog post about the Rob Walker lecture. Faythe Levine was the concluding speaker for the first day of the Conference. She is the rather infamous director of the film titled, “A Handmade Nation”. CLICK HERE IS SEE A 9 MINUTE VIDEO CLIP on YouTube. At this point, there is also a book, Handmade Nation: The Rise of DIY, Art, Craft, and Design . The production of this film seems almost mythical since she financed the entire project herself as well as the filming and editing as a personal mission to document the D.I.Y. (Do It Yourself) movement. She traveled all over the United States to interview D.I.Y. artists and eventually winnowed down to the artists featured in the film. While traveling and filming, Levine generated visibility for the endeavor within the D.I.Y. community using the Internet. Since this community is largely a youthful subculture of 15 to 40 years old, word spread rapidly and even gained notice in the craft world at large. I look forward to seeing the film, but we will stick to the content presented and the "vibe" that reverberated during the Conference. Video shows a Postcard Machine by Michelle OTT. The artist sits inside the box, making postcards. Passersby turn the dial selecting a criteria for their hand-made postcard purchase. Faythe Levine's presentation was very well done including video snippets within the presentation. She showed interesting examples of work from the D.I.Y. world including the Postcard Machine (video above) and the images of artists' work included in this post. It was kind of like we were roaming through a virtual Bazaar Bizarre. Despite the visual feast, I found Levine's demeanor subdued. She did not look like she was enjoying this opportunity to share her world. Maybe she was feeling self-conscious and unappreciated by the audience representing the established craft world of academics, galleries owners, craft organizations, and patrons. The D.I.Y. community was definitely a minority at the conference, but some were there such as Garth Johnson, www.extremecraft.com. Emiko Oye and I both participated in Etsy and Maker Faire, maybe there were others we didn't know. It seems that the D.I.Y. world has excitement, trendiness, irreverence, and a fashion forward appearance. The alternative craft fairs have funky names like Crafty Bastards, Renegade Fair, and Bazaar Bizarre. They know how to have a good time and how to market themselves! Just to be clear, I have no blind allegiance to either the established craft world or the D.I.Y. world. I don't understand nor agree with the dismissive antagonism from either side. In my opinion, there is plenty of boring or badly made work AND fabulous work in both arenas. I frequently see parallels between the current D.I.Y. community and the craft world of the 60's and 70's that often represented an alternative lifestyle and less sophisticated fabrication. Just one example among current D.I.Y. makers is the use of the Peace symbol from the 60's time period. "What does she like?" Her tastes have grown. Ms. Levine said that after meeting so many artists and makers in the D.I.Y. world, she would possibly be more discerning in her criteria for selection of people in the film, the book and personal purchases. She made this comment inferring that she had begun naively, but with extended exposure she's learned to evaluate the quality of work much like a curator. WHAT DID I LEARN? We all should watch the film, "Handmade Nation" and see what we think. Despite the egalitarian aspect of the movement, the cream still rises to the top. LIFESTYLE OR LIVELIHOOD? It seems to me that most people are not making a living off their work. There are exceptions, of course, but both the D.I.Y. world and the craft world struggle with generating income from selling their work. Thus livelihood remains out of reach and lifestyle is an aspiration. SUMMARY: Both the D.I.Y. and the established craft world have A LOT to learn from each other. If they continue to be antagonistic or consciously ignorant about what the other has to offer, they are both doomed to marginal financial success. I look forward to your comments. Please write to me directly or leave a comment. Friday afternoon at the ACC Conference .... so far our brains are filled to the brim with dedication and commitment to craft as both lifestyle and livelihood. This lecture served as a metaphorical transition and connection between the professionalism of craft in the "Mixed Taste" lectures and the D.I.Y. concept in the final lecture of the day. (Stay tuned for the next blog post on “Handmade Nation”.) Bravo to the organizers of this conference who found such dedicated individuals committed to their craft and social practice, and to the careful planning in regard to the order of the lectures. It makes total sense. Natalie Chanin built her business almost as an accident, but worked hard to turn a serendipitous moment into a lifestyle and livelihood. After designing and sewing 200 one-of-a-kind handmade shirts, she naively took them to Fashion Week in New York to “shop them around" on the hope of finding stores that would purchase the shirts. Surprisingly, the buyers at Barney's asked to buy 12 of this shirt and 12 of that! “What!” she says, "They are all one-of-a-kind!" The store buyers said, “Well then, just make them similar.” Flustered and overwhelmed Chanin "channeled her grandmother" and went back to her roots in Alabama. She employed local women living in depressed rural areas (with limited or maybe even non-existent employment opportunities) to sew in their homes. A Story of Thread is another lecture that illustrated a thorough understanding of a craft (in this case thread and sewing), knowing the material (fabric and trims), and personal drive believing in making the impossible a reality. It took hard work, inventiveness and ingenuity to create a unique and rewarding path. Ms. Chanin believes in the personal connection between the maker, the materials, and your approach to life. Loving your raw materials and working with deep sincerity WILL MAKE THE MOST BEAUTIFUL OBJECTS possible. This is both physics and good karma. Ms. Chanin's clothing connects generations of both fabricators and patrons. Once again, the end product is the result of decisions based on social and political goals and expectations. The cotton is locally grown (Texas) and sewn as a cottage industry which offers employment to southern garment workers displaced by NAFTA. Even the scraps of fabric are recycled into a furniture line reducing waste. Instead of seeing her clothing and business as a product for a privileged few (admittedly, the clothing is expensive), she seeks to involve a broad community. She wrote a book titled: Alabama Stitch Book: Projects and Stories Celebrating Hand-Sewing, Quilting and Embroidery for Contemporary Sustainable Style to educate others about the techniques she uses in the construction and ornamentation of her clothing. She sells patterns for her two best selling garments, the fabric, thread, and materials directly to the D.I.Y. (Do It Yourself) community. Although some could think that this generosity would negatively impact her primary market, she has developed a whole new business. Her vision also includes collecting the oral histories of these southern women that sew for her. It is a way to honor this craft and the life stories of these women. These women see themselves as craftspeople, where craft is everything and preserving cultural traditions is important. Questions and answers were not particularly revealing. Natalie Chanin proved in the most unexpected manner that both lifestyle and livelihood from craft were possible for both herself and her cottage industry. In this lecture we did not hear how much the women are paid to sew her garments (i.e. piece work or an hourly rate) nor if this amounted to a “living wage.” On the other hand, her garments were offering a source of income in remote rural areas that have lost almost all the manufacturing employment in the area because of NAFTA. Sincerely following your core beliefs in a creative vision and your roots as a maker can be both meaningful and profitable. Socially and politically responsible decisions can make money. You must be ready to adapt in surprising ways to successfully create a market for your work. SUMMARY: Follow your path with all your heart. The ACC Conference web site now has their own review of the lecture and a podcast. ACC Conference: Adam Lerner - "Mixed Taste: Tag Team Lectures": Prairie School Architecture & Clancey's Meat and Fish. The premise of the lecture format called, "Mixed Taste" (developed by Adam Lerner) was an unusual combination of two seemingly unrelated topics. Examples of previous programs offered by Lerner included "Tequila and Dark Energy in the Universe", “Marxism and Kittens, Kittens, Kittens,” and "Soul Food and Existentialism.” After both lectures, Q & A is opened for both topics at the same time. These are just a few examples from a lecture series organized by Adam Lerner. His first program debuted many years ago and had only 20 people in the audience (mostly friends and family), but his audiences grew exponentially! By, the time Lerner closed the series at his alternative space, he sold out every show to the maximum seating capacity of 330 people. The audiences included punk kids to retirees. Now this type of programming continues at the MOCA (Museum of Contemporary Art) in Denver where Adam Lerner is Director and Chief Animator in the department of structures and fictions. You may be wondering why I am spending so much time telling about the lecture format, but it was a really cool, gutsy idea! Maybe you will want to use it next time you plan a program for your local arts group. The two topics at the ACC Conference were "Prairie School Architecture" with speaker Jennifer Komar Olivarez, Associate Curator, Architecture, Design, Decorative Arts, Craft, and Sculpture, Minneapolis Institute of Art and “Meat Fabrication” with Kristin Tombers, owner of Clancey’s Meats and Fish (also in Minneapolis). Each speaker spoke for twenty minutes on their seemingly unrelated areas of expertise. The interesting thing was that after listening to both lectures I realized that these two seemingly unrelated topics had a lot of connections. It was very surprising! Both Prairie Architecture and Clancey’s Meat and Fish depended on local talent. Both are dependent on local entrepreneurship. Both were inspired by an accidental moment. Both depend on the dedication, vision and commitment of individuals. Both depend on quality craftsmanship and problem solving for success. Both represent the livelihood and lifestyle of creative individuals. Both ideas are dependent on patrons who are willing to support artistic vision. And NOW a summary of each lecture. all designed to go in local historical Prairie School Architecture homes. Don’t miss this if you go to the museum or see an online tour by CLICKING HERE. My summary of Prairie School Architecture will be inadequate compared to getting a book from the library or looking online. Jennifer showed us excellent visuals illuminating the unique features of Prairie School Architecture and highlighting the key factors that were important to the development of this particular style. There were three concepts presented that can apply to our careers as makers. First, the “Prairie School Architecture” was enabled by an accident, the 1871 Chicago Fire, which presented a great opportunity to rebuild an entire community. The situation essentially created both a blank slate for new design influences and a huge demand for architects to produce designs. Second, the importance of the teacher/mentor-intern/apprenticeship relationships among the architects of that time who evolved into a lineage of design influences for several generations. Third, talented individuals had to work hard to develop new ideas. Kristin Tombers came to own Clancey’s Meat and Fish after an accidental meeting where she learned that the shop was for sale. Since purchasing the job six years ago, Kristin has dedicated herself to buying and selling local quality meat and fish for her customers. She is a hands-on advocate for the “locally grown” and sustainable practices of raising animals in a healthy environment. Part of her advocacy is educating her patrons about why her products are better than the plastic packaged foods in the grocery store. This deep commitment to her meat fabrication set the stage for her speaking appearance at the ACC Conference. One more lesson we can learn from this speaker is her entrepreneurial spirit. In addition to the butcher shop, she supports community supported agriculture by being a “drop site” for locally grown fruits and vegetables. The people who come to pick up their produce become her customers. And finally, once a month she prepares a gourmet dinner for an intimate group of patrons using quality, fresh, locally grown, seasonal fruits, vegetables and meats. Speaking quite convincingly, she thinks of her effort as craft. Her meat fabrication shop requires skill and absolute dedication to both her farmers and customers. It reflects a lifestyle choice of everyone involved, from the producers to the patrons. Her genuine authenticity about this decision filled her lecture with an intensity that captured everyone's attention in the auditorium. It was inspiring! Every student, teacher, emerging artist, gallery director, curator, and patron should fill their hearts with such sincerity. The art and craft world would be much better for it. WHAT QUESTIONS WERE ASKED AND ANSWERED? Questions and answers were weak relative to the quality of the lectures. People got up to express their opinions rather than to ask a question. Maybe it is just too hard to formulate a good question so quickly after so much insightful information. One person opined that since quality local food often costs more, it is a socially elitist choice. This is a shortsighted assessment and I strongly disagree. I make a habit of buying seasonal, locally grown fruits and vegetables and cooking quality food at home. The item itself may be priced slightly higher but it is more flavorful, more healthy and less expensive per meal versus eating from factory farmed products, junky processed, prepared or frozen food or fast food. This seems to be a matter of education and commitment. Not even considering the broader environmental impact, the overall direct benefits and net savings for me personally justify a commitment to fresh, local foods. Both of these speakers covered examples of combining lifestyle and livelihood. Kristin Tombers from Clancey’s Meat and Fish made it quite clear that if she didn’t make a profit she could not afford to stay in business. Customers see her level of commitment to quality and value for her customers. She says the neighborhood is hungry for hand-crafted, quality goods. They want to support her business for their own benefits. Sincerely following your core beliefs in a creative vision and your roots as a maker can be both meaningful and profitable. Socially and politically responsible decisions can make money. SUMMARY: Passion, authenticity, hard work, and commitment are keys to success. And you have to interact and find a market segment that wants what you deliver. Please feel welcome to offer your opinions as comments. Information and interviews with Will Allen (and his MacArthur Genius Grant) educating urban people in Milwaukee about locally grown vegetables. Keep talking about this topic and move it into all social classes. For another perspective, read the blog post on emiko oye rewarestyle. The movie Food,inc currently in theaters. Blogging about the recent ACC Conference is definitely going to take "HOURS OF Fun and Challenge." In the meantime, be sure to see Rob Walker's article in the Sunday New York Times Magazine (October 18, 2009) about Pandora Internet Radio. While Pandora is not craft, don't dismiss this as irrelevant. Part of the article talks about the algorithm used to generate music selections that the listener may like. At the Conference this topic came up. "If you like _______(fill in the blank with a book, movie or consumer item), then you might like this." Generating this type of suggestion on 2.0 sites selling art, and/or craft like Etsy, ObjectFetish/Jewelry or The Artful Home has been impossible (at least so far). This is JUST WHAT WE NEED for clients and prospective buyers to search for art/craft more effectively, taking advantage of the Web's "long tail". The first art and craft site that can offer this type of search will become the new market leader. How long will it take for this to be possible? In my opinion, one of the ingredients for success will be more consistent and effective tagging. I will write more about tagging and SEO search in future posts after finishing the Conference review. In the meantime, I highly recommend reading the book The LONG TAIL: Why the Future of Business is Selling Less of More for fully understanding the potential of the Internet to market your art or craft. Information for ACC Conference attendees is posted on http://Murketing.com. Find the links Rob Walker is providing for ACC Conference people and the people "listening in" to this blog. This post is written from my Flickr site (as an experiment). Hope if looks O.K. If not I will fix it soon. The ACC Conference 2009 is over. It was a very enriching experience but there was far more information every day and every lecture than I ever expected. As the new week begins, I have re-examined my plan for blogging about the Conference in near real time. It is impossible. So I have decided that it will be better to post a review of each lecture or panel discussion but spread this out over a couple of weeks. This will be 2-3 posts a week. This gives me more time to digest each lecture and a more realistic schedule for everyone reading the blog posts. Both my Twitter and Facebook will indicate new posts, or you can subscribe to my blog. Overall, I think the Conference was a rewarding experience. Each and every one of the presentations far exceeded my expectations. I took notes as fast as I could write for two days SOLID! My future posts will digest this information for your review and include links to books and web site resources for further investigation. Perhaps the most significant aspect for me personally was meeting so many new people. I particularly liked that the lunches were only one floor down from the Conference room. Everyone walked down together, you sat down next to someone you just met and finished lunch with a new friend. The bad side was that I never left the hotel for two days and emerged like a mole from underground on Sunday morning. Stay tuned for each post and links to other blogs posting about the Conference, books mentioned during the lectures and web sites with additional information. Rob Walker promised information for ACC Conference attendees on his blog Murketing.com. CLICK HERE to find the link he is providing for ACC Conference people and the people listening in to this blog. Also this Sunday's New York Times Magazine (October 18, 2009) features a four page article by Rob Walker about Pandora Internet Radio. Although Pandora is not craft, don't dismiss this article as irrelevant. If you want to learn more about marketing your art and craft on "the long tail" then get started with his article and think about how to apply this marketing for your art or craft online. To understand the "long tail" phenomena, I highly recommend the book Long Tail, The, Revised and Updated Edition: Why the Future of Business is Selling Less of More written by Chris Anderson. Don't forget to check out what Emiko-0 rewarestyle has to say for another perspective. Saturday, Day Two to the ACC Conference. The content of the Conference has been rather intense -- for a blogger, totally overwhelming. Last night I managed to do the first three lectures, the rest will have to wait. This has truly been a race with time. Today is the big day, the lecture that I have been waiting for... Rob Walker is about to begin! Stay tuned for more insights and more information about 2.0 marketing. This panel was put together on the premise that the craft community is not having deep conversations about surviving as a craftsperson. However, I do not think this is true. I hear these debates all the time. Do you discuss this issue with your fellow artists/makers? I would guess that the vast majority would say, yes. The structure of the panel was based on five myths and asking each of the speakers to address the following myths (one at a time) in reverse order (starting with #5). #5 You don't need to use traditional craft materials to be a craftsperson. #4 Craft is an environmentally sustainable set of practices. #3 Functional craft is less important than one of a kind work. #2 Making it by hand makes it craft. #1 The craft field is dying and D.I.Y. will save it. The three panelists all responded quickly. Tom Patti and Claudia Crisan seemed more articulate and stayed right on topic. Michael Sherrill seemed kind of "wishy-washy." Knowledge and training of craft makes it craft. Using technology is OK, it is just a different way of making. It sounds like she also makes one of a kind work for exhibition. Crisson now supports her work with an edible art bakery. Wow! People actually eat her work. His artwork looks really amazing, but his comments were not. He also sells tools. He must be very good at that because it sounds like this is his livelihood. Doesn't make the distinctions between one of a kind work and functional craft. These were all issues to explore with no hierarchy. Craft world never accepted him because his work looked machine made. Conviction of the maker / artist is the most important element. Craft is always practicing, making better and improving. Tom Patti never said how he supports himself, but it seemed that the architectural projects were a significant part of his livelihood. WHAT QUESTIONS WERE ASKED AND ANSWERED? One person from Martha Stewart Living got up to speak about how Martha Stewart is supporting 50 ? artists as her employees. Later that same day, at lunch, Helen Drutt spoke from the podium saying that Martha Stewart had no place in this Conference. Helen Drutt always has strong opinions. It certainly was an entertaining and memorable moment! I like when people are outspoken with firm convictions! Another person mentioned a comment from Sennett (the opening speaker) ..."People need to have more understanding of what they are doing." Comment from audience: "Craft/art teaches our children critical thinking and problem solving so that our children can be successful in the work force." WHAT DID I LEARN? Nothing new, but the images were great. Organization of the program was excellent. LIFESTYLE OR LIVELIHOOD? All of these people had both a lifestyle and a livelihood from their craft, one way or another. SUMMARY: Interesting format. Again, a strong summary as a conclusion would have left the audience with great points for further conversation. ACC Conference: Elissa Auther lecture - "Lifestyle and Livelihood in Craft Culture"
The presentation was a well articulated history of craft focusing on the lifestyle vs livelihood issues through the decades. The lecture contained no surprises, if you are familiar with the history of craft. The romanticized image of the 19th century craftsman intertwined life and lifestyle to restore the dignity of labor. William Morris and John Ruskin both considered craft as meaningful work. Skipping forward to the mid-20th century, the 1950's again integrated work and lifestyle. Elissa also mentioned the photography of craft from the 1950's and 60's where craft was photographed in nature. This analogy is very strong with George Nakashima's work where he used large slabs of wood with the form of the tree still evident. Craft shifted toward representing an alternative lifestyle with Wildenhain whereby craft was an expression of a way of life. The process and experience of making along with honest labor were considered paramount, while the finished work was an object but much less important as to meaning. In a similar tone the current D.I.Y. movement of the 21st century is a similar resistance to mainstream economy. Crafts once again become a political, anti-establishment, rejection of the elitist art world and consumption of manufactured items. Yet at the same time, this D.I.Y. movement along with Etsy are marketing their craft work by developing their own marketing strategies. While Auther offered many facts, I was not surprised by the information. Most of the lecture seemed to suggest that craft was a lifestyle or identity within a group or community. There was little evidence with the exception of Cosanti, and Arcosanti that craft can be a livelihood. The D.I.Y. movement and Etsy phenomenon, in my opinion, are simply another sales channel selling "stuff" in our consumer society. WHAT QUESTIONS WERE ASKED AND ANSWERED? The best question was a comment from the curator of the Oakland Museum. She suggested that the craft lifestyle was only a product of California or of the western United States. Most of the other questions -- again, I wish people would ask their questions quickly instead of burying the question in a long winded comment. WHAT DID I LEARN? Nothing new, but maybe others less well versed in the History of Craft left with more information. SUMMARY:Very nice presentation with great images. Clear voice, easy to understand. My only criticism is that this lecture could have been improved with a strong conclusion reviewing her key points and revealing her educated opinion about lifestyle or livelihood. ACC Conference: Richard Sennett - "The Craftsman in Society"
Richard Sennett is a sociologist and writer who divides his time between NYU and the London School of Economics. Sennett’s book The Craftsman describes the "desire to do a job well for its own sake" as a basic human impulse. The web site for Yale University Press offers multiple podcast interviews with Sennett. Additional information can be found in American Craft Magazine, October/November 2009 where Richard Sennett is interviewed by Suzanne Ramjlak (editor of Metalsmith Magazine). This issue is available at your local bookstore. The lecture was delivered without images so you didn't miss anything visual. The information was quite dense and thought provoking. Actually it was a little overwhelming and essentially a precursor to the level of presentations for the entire day. I am going to summarize this briefly here and come back to the lecture in the next couple of weeks when I have had more time to digest the topic. In short, Sennett feels that rewards for the quality of work are disappearing in our modern society. The academic environment sets the stage with standardized testing which asks for quick, fast, and standard answers. Creativity is not rewarded. It continues in manufacturing which dumb downs each job into menial tasks. White collar corporations value group co-operation, community and team work to come up with quick, good enough solutions rather than a highly skilled, deliberative, and slow solution. In Sennett's words, "Quality is less important than results." Unfortunately, Sennett used Open Source Code as an example of mediocre solutions. This metaphor ran through his lecture continuously. It was very hard for me as a maker/artist to think that writing computer code is the same as making an artwork. As far as I'm concerned it sounds like he never made any artwork ever. For me, it seemed a very irritating and clueless comparison. Yes, I agree that our modern society is inundated with cheap, low quality merchandise, but I refuse to accept that there is no market for quality as a blanket statement. WHAT QUESTIONS WERE ASKED AND ANSWERED? I can't even remember the questions. People got up to speak but spoke for so long that I never heard a question, if there was one. Whatever question that may have been there got lost in verbiage. WHAT DID I LEARN? That I am not interested in reading his book. If you read the book let me know. LIFESTYLE OR LIVELIHOOD? Well, this question may not apply directly to Richard Sennett since it doesn't seem he actually makes anything himself. He did not address the issue in a direct sense. Who is going to pay for slow and deliberate work, in a market driven society? The harsh reality (for most artists) is that it takes a tremendous amount of personal conviction and a couple of other jobs to subsidize the making of the best work with slow, careful and thoughtful effort. Going back to Sennett's theories, it seems that he is advocating for a lifestyle more than a livelihood. If going slow and thinking carefully about how to produce work (which I endorse personally) provides a personal value to the maker, perhaps it is not a marketable value to potential buyers. If that value can not be recognized in the marketplace, it is much less likely to be able to make a livelihood from your work. SUMMARY: Stay tuned for more from emiko oye. ADDITIONAL RESOURCES: ACC Conference web site now has their own review of this lecture and a podcast. ACC Conference - the lectures begin. The lectures for the 2009 ACC Conference begin today, Friday morning, Oct. 16. Before reading any of my posts you should know that I can be very critical of lectures and presentations. A good lecture and presentation should show a cohesive structure to the content, with lots of images illustrating the key points and displayed in sync as the speaker addresses the topic. The speaker should make relevant comments about a slide but not read from the slide or their paper. There should be no (or very few) audible pauses (my biggest pet peeve) such as "uhs", "ands", "aaaa", and "ummmms." If my review of a lecture lists the number of audible pauses, then you can be very glad that you haven't come to this particular lecture. I am also going to try to write a commentary about every lecture...during the conference. That may be very ambitious, so please bear with me if there are spelling errors or other mistakes. I intend to go back and fix them later. Each post will include BACKGROUND INFORMATION on the speaker or topic, if possible, and an attempt to answer three issues and a short summary. Was lifestyle or livelihood covered as a topic? If the speaker has written a book or if a book about a related topic can be found, it will be in the right hand column on the blog. Click on the book for more information. Subscribe to my blog or look for the blog posts updates sent to my Twitter and Facebook. If you are on either one of these sites look for me there. Looking forward to an informative and hopefully informative conference. Today was unlike any other, a rare visit to the inner sanctum of a major museum. I am in Minneapolis and met the curators at the Minneapolis Museum of Art. This time together gave me an amazing inside view about how curators make decisions about acquisitions and other behind the scenes insights. This is in stark contrast to my situation over a year ago when I was first invited to make a Seder plate for the Dorothy Saxe Invitational at the Contemporary Jewish Museum in San Francisco. I felt that this was a special opportunity but would require unusual effort to participate with a stellar group of other invitees. Starting in July 2008, I decided to put all other artwork aside to focus my attention on this Seder plate. I still remember days of torment and misgiving. Will it turn out OK? I invested 100's of hours into one piece determined to make the best Seder plate I possibly could. Could I really achieve museum quality work? The isolation and challenge to make a piece unlike any I had ever made before led to recurring moments of self doubt. But today, I saw my Seder plate Eons of Exodus at the Minneapolis Institute of Art displayed front and center in the Judaica collection. And, yes, I AM smiling. It's like winning a marathon. I know how exhausting it was to make this with no certainty of any recognition. I just want to encourage anyone out there to always strive for excellence. There may be no accolades other than the knowledge that you did your best. On the other hand, occasionally, curators, collectors, and donors will indeed see what you have accomplished and share it with others. My deepest thanks go out to the curators and donors of the Minneapolis Museum of Art. ACC Conference 2009 - How can you stay in touch? Thursday is the first day of the American Craft Council Conference events. Technically, I suppose these are pre-conference activities. I have signed up for a tour on Thursday afternoon to The High Point Center for Printmaking and the Minneapolis Institute of Arts. At the museum I hope to see my seder plate Eons of Exodus which is on display. As you may know I will be blogging as often as possible during the next three days October 15-18 about my experiences at the Conference including the events, presentations, panel discussions, and speakers. The title of the Conference is "Creating a New Craft Culture." This is described as investigating "the inherent tensions between craft as lifestyle and craft as livelihood." This is an ambitious goal, but I do applaud that the Conference programming and presentations appear to be on target with the Conference theme. You can find information about the presentations by CLICKING HERE. If you would like information about the speakers CLICK HERE. If you just want the quick overview of the entire Conference program CLICK HERE. Emiko Oye will also be blogging at the Conference from her own perspective. You can find her blog at: http://blog.rewarestyle.com/. We are both members of SNAG and the online communities of Etsy, Object Fetish, and Crafthaus. In addition I am on Facebook and Flickr. Check out the these sites NOW for more information about the 2.0 marketplaces and social networking sites. You may learn more background on the subjects and view some of the content to be addressed during this conference. I anticipate that these sites will be mentioned often during the speaker presentations and panels. Whether "craft is a lifestyle or a livelihood in the 21st century" it will definitely be on the Internet. In addition, I think that there may be additional blogging on ObjectFetish and possibly Crafthaus or the ACC Conference Blog Beat. Some of the sites mentioned above are purely social networking (such as Facebook and Flickr). In comparison, Etsy is an online marketplace where buying and selling is a primary objective. Facebook and Crafthaus may be a combination of both social networking and online visibility or marketing depending on the artist. bermaid [at] harriete-estel-berman [dot] info. Subscribe to my blog so you don't miss one post by CLICKING HERE for Feedburner. Blog posts updates will also be sent to my Twitter and Facebook. If you are on either one of these sites look for me there. I'm off to my adventure at the ACC Conference in Minneapolis, Minnesota where I will be one of the official SNAG bloggers posting my experiences along with initial reviews or opinions of the lectures presented at this national conference. With the conference starting in just a day or so, I am filled with anxiety and some trepidation. Why am I leaving the comfort zone of my home, my studio, my exercise classes, and my every day routine for the torture of an airplane seat and three days of blogging responsibilities? Is it worth going? Even, why am I doing this? The simple answer is that I need to create new experiences for myself. Despite these discomforts (or because of them) I know that some positive insights will come out of this experience. Call it brain exercise or mental stretching, but everyone needs to try going to some kind of conference once in a while. I have heard that some people don't go to the SNAG Conferences because they aren't fun. Are you kidding? It's not the fun you should go for, but the growth that you can acquire. Maybe some people think these events are fun. I don't. Going to a conference lets (or forces) you to be exposed to the unexpected, meet new people, and listen to the lectures. The outcome is always unpredictable. Sometimes a lecture topic may sound like a dud, but the speaker turns out to be exceptional. Or the lecture topic may seem really interesting and the presentation skills of the speaker are disappointing. The variety of conference events may be a mixed bag, but upon reflection afterward, I have always gained some professional contacts or artistic insights. While I am in Minneapolis, I do plan to take advantage of the resources in the area. My scheduled excursions include visiting the Minneapolis Institute of Art to see my seder plate "Eons of Exodus" on display AND listen to my literary "hero" Rob Walker, author of Buy In, The Secret Dialogue Between What We Buy and Who We Are . 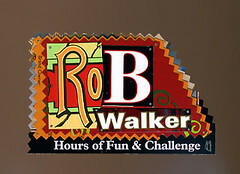 Rob Walker is a speaker at the American Craft Council Conference and one of many reasons that I decided to attend. Stay tuned for daily posts (maybe even multiple posts per day). Saturday's program covers Web 2.0 marketing and hopefully it will be very enlightening. We can only speculate on what the panel has to say. Did you read my previous posts about marketing, 2.0 and artist gallery relationships? If not, please read this information and send me your opinions and ideas. In particular, if you have a question or two to ask the speakers and panelists, what would you ask? Let me know and I will do my best to find out the answer to your questions. This is Part 2 about rethinking the commission structure between artists and galleries and affiliate links. Part 1, Online Marketing Tips: Gallery + Artist Collaboration and Affiliate Commissions can be found here. To take full advantage of Internet marketing and promotion, the artist and gallery should collaborate to create a web of links to enable buyers to find and make a purchase as easily as possible. And there should be monetary incentives to encourage such collaboration. The incentives need to reflect that buyers may be attracted to make a purchase from several different paths. The incentives should also accommodate the fact that galleries represent a number of artists and likewise that some artists may have work available for purchase that is not at the gallery location. Both the artist and gallery would benefit from a retail purchase and the Internet no longer limits selection to the shelf space or pedestal displays in the gallery. I am suggesting a performance-based, shared commission structure. In many business fields, a referral earns a referral commission of 10% of the ultimate proceeds in a transaction. Taking this precedent, I propose that artists and galleries set up "affiliate links" where either party would get 10% of a purchase price simply by referring a buyer to the other website. Here are a few scenarios. Scenario 1. If the client finds the gallery through the gallery's web site and makes a purchase from the gallery, the artist and gallery split the retail price with the usual 50%/50% commission structure. In this example, the gallery's online marketing efforts facilitated this purchase entirely. Scenario 2. If the client finds the artist through the gallery's web site and buys the artist's work not currently represented by the gallery, the gallery gets 10% of the purchase price. In this example, the gallery's website achieved the introductory marketing and facilitated this purchase. Scenario 3. If the client finds the gallery through the artist's web site and buys another artist's work at the gallery, the referring artist gets 10%. In this example, the artist's website achieved the introductory marketing and facilitated this purchase. Scenario 4. If the client finds the gallery through the artist's web site and buys the artist's work at the gallery as a result of this referral, the artist gets 10% plus their usual 50% (a total of 60%) because the artist's web site facilitated this purchase. This may all be on the honor system, or an affiliate structure can be set up through an affiliate web site. (There are many affiliate web sites that track the cookies and traffic of online purchases.) There are many possible variables, but I hope this starts a dialog. A radical idea? The fact is that this is a performance-based incentive program for artists and galleries to become advocates for each other. It simply follows the precedent of millions of other business affiliate links on the web. Just another step into 21st century marketing. What do you think? I'd like to hear your opinion about this idea. Either leave a comment or email me directly by CLICKING HERE. SPECIAL NOTE: THIS WEEK, October 17 - 19, 2009, I will be attending the ACC Conference in Minneapolis and blogging about the lectures and discussions. Subscribe to my blog so that you can get the daily updates by CLICK ON THE SUBSCRIBE BUTTON to the left of this column. Hear what Rob Walker has to say about 2.0 Marketing and the panel discussion with Namita Wiggers, Riding the Long Tail, Marketing Craft on the Internet. Panelists include Lisa Bayne from Guild.com; Amy Shaw of Greenjeans; and Maria Thomas, CEO of Etsy. I have been reading your blog and your posts and I was wondering if it is a good idea to have a link to my Etsy site on my website. My website has a shopping cart but I have sold only seven items on the website in two years and over 100 on Etsy in a year. My galleries also look at my website, so Etsy and the website and the gallery prices are all the same. What do you think? Erica, The simple answer is YES. But I would like to go into some details, so I will discuss Marketing on Etsy in this post, and discuss Marketing on The Artful Home in a later post. Part 1. Marketing on Etsy. Your first question was "...is it a good idea to have a link to my Etsy site on my website?" YES, by all means, link your Etsy shop on your web site. Linking is the most powerful aspect of the Internet and you want to give a potential buyer EVERY opportunity to find and purchase your work. Make sure that you include links on your web site to the galleries that sell your work also.Perhaps you can dedicate one page on your web site to all the galleries and online locations where prospective buyers can find your work. Include links to every location with complete contact information. Work with your galleries to promote your work. Etsy is a very convenient marketplace for artists and craftspeople to sell their work. You also did yourself a favor to show the same price on Etsy as in your gallery. It is in your interest, and the gallery's, to standardize your prices and keep them the same at all locations, whether virtual or real. From the buyer's perspective, a purchase from Etsy is no different than a purchase from any other gallery. Another point is to use the entire word "Etsy" in a link on your web site such as "Find my jewelry on Etsy" with a hyperlink to your Etsy shop. Another option is to create one of the Etsy mini with thumbnail images including a selection of your work. (Both of these are shown here). You could use one of their widgets, I've noticed the super short hand Etsy "E" on some sites, but don't think that is as effective. Not all the people on your web site will know what it means. Clarity is important. The primary difference between a gallery and Etsy is that online people are looking at only photos, not the actual work. This means your photos need to be fabulous!!!!! I looked at your Etsy shop carefully and found this fabulous necklace, but your photo was very dark and murky(see above image.) This photo is not good enough to sell your marvelous work. I adjusted the photo (below right) by first brightening the image in PhotoShop, and then increasing the contrast. It took 5 minutes at the most. Which do you think is more effective? If you're not yet proficient with PhotoShop or any other photo editing software, it is important to learn. Learning how to edit photos is like any other skill in your tool box and a must in this digital age, especially if you want to market your work successfully. While I was viewing your Etsy shop, I noticed a couple of other problems. The tags and descriptions for your photos were close to non-existent. Search engines won't rank your work unless you tag your work thoroughly and accurately along with an excellent description and an informative descriptive title. Etsy has many useful tutorials for their sellers but here is a short explanation to help the search engines bring buyers to your site. Learn to use every one of the the fourteen tags available on Etsy. Here is a sample list of tags that I might suggest for your work. Maybe you have other ideas. For your description on Etsy you need to list much more than "wood." Talk about the style of the necklace (reusing your tag words, if possible). Talk about your inspiration and anything else that might interest the buyer. Think about the search terms that a buyer would use to search for and find your work. Etsy descriptions are usually in first person, but this isn't a requirement. For a necklace like yours, it would be a great idea to show how it looks when a person wears it. Show the necklace on a model (only show the lips down to an inch or two below the necklace on a suitable garment). Read the recommendations about using a model in GUIDE TO PROFESSIONAL QUALITY IMAGES in the Professional Guidelines. Prices should be the same on Etsy and your galleries. Always include a title, complete and accurate description, and meta tags on all the work you post online. Make sure that your photos are the best possible images. The next post on Thursday will discuss issues with The Artful Home.